Egypt''s President Abdel-Fattah E-Sisi met with the Secretary-General of the United Nations (UN) Antonio Guterres in Addis Ababa on Saturday on the sidelines of African Union (AU) summit, which is set to start in the Ethiopian capital on Sunday. The Egyptian President expressed to the secretary-general, who is attending the summit, Egypt's aspiration for a qualitative shift in boosting and deepening strategic partnership between the AU and the UN in the fields of peace, security and development. The Egyptian President will formally assume the 2019 chairmanship of the AU on Sunday. In an official statement, Egyptian Presidency spokesman Bassam Rady said El-Sisi presented to Guterres Egypt's vision of the priorities and the main topics which it aims to push for under its chairmanship of the African body,. Rady added that Egypt's vision for the AU this year aims to target a continued progress in executing the agenda of continental progress in Africa, and the projects of integration and inclusiveness in the continent. El-Sisi had arrived in the Ethiopian capital earlier on Saturday. 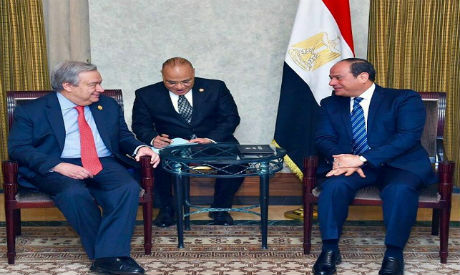 Egypt plans on achieving progress in resolving conflicts in the continent, as well as the continuation of efforts to boost African structures of peace and security in Africa, El-Sisi explained to Guterres. The issue of structural reforms in the UN was also discussed, with El-Sisi affirming the importance of Africa's participation in the process, Rady added. According to the statement, Guterres congratulated El-Sisi on Egypt assuming the chairmanship of the AU. "The UN is relying on Cairo in boosting the means of cooperation and integration with the union," Guterres said, according to Rady. The secretary-general expressed his appreciation of the lasting cooperation between Egypt and the UN on all levels, the presidential spokesperson said. El-Sisi congratulated his counterpart on his victory in the Congolese elections, praising the popular awareness in the DRC of the importance of the elections in preserving the stability and security in the African country which through an orderly transition of power. The Egyptian president also stressed to President Tshisekedi Egypt's keenness on continuing Egypt's help to the DRC in light of the strong, historic relations between the two countries, describing these relations as "a model of cooperation and coordination and mutual support." From his side, Tshisekedi said he valued both countries friendship and brotherly relations, expressing the DRC's ongoing support to Cairo on all developmental issues. The 32nd AU's summit will be held under the theme of “Year of Refugees, Returnees and Internally Displaced People," which the spokesman earlier said was chosen due to Africa’s efforts to stem influx of returnees and refugees and a rise in human trafficking.